Recently I was asked to make a pair of bathroom vanities for a relative. She is in the process of renovating a new-to-her home and needed a budget friendly option. I designed the vanities in SketchUp first for her approval. She liked the design and agreed on using pine to reduce cost and chose Early American Minwax stain. At the end of this article is a downloadable PDF guide that goes into greater detail than this article. 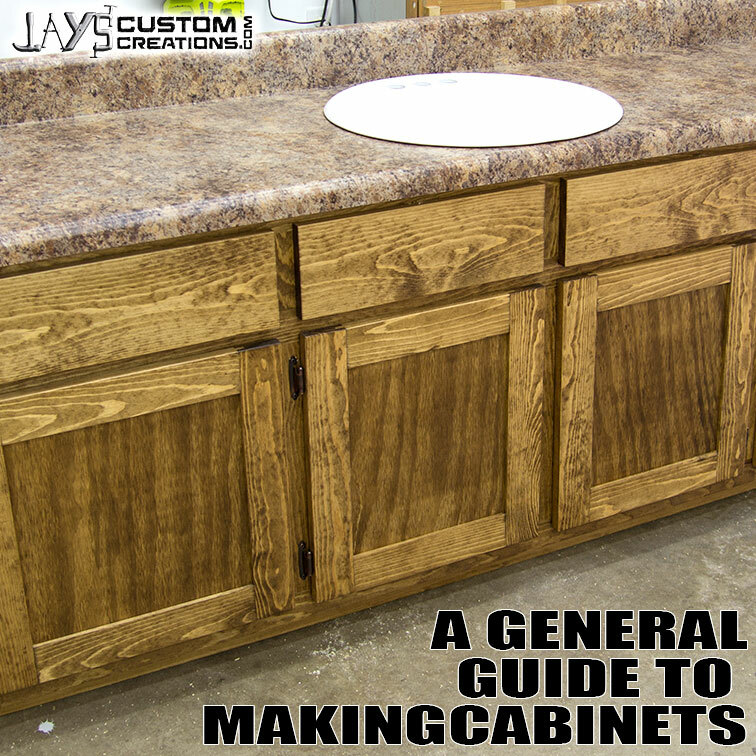 The goal of that guide is to give you general direction with a strong building method for cabinets. 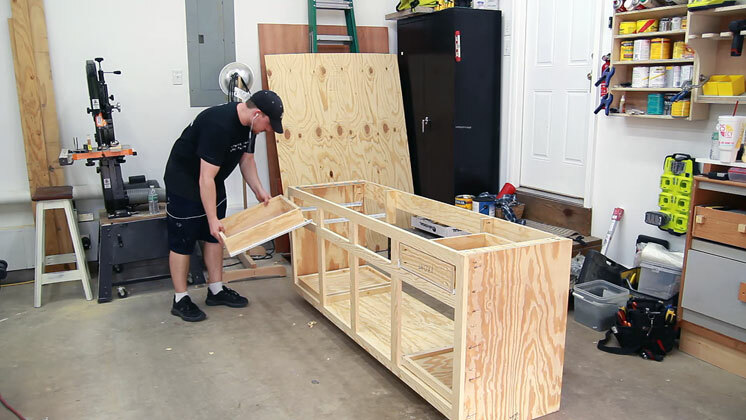 Hopefully it will be of some use to those who are looking to build cabinets and are looking for a reliable method. The design I came up with is a very conservative straight line design. Nothing fancy. No edge details. The drawer fronts are just a piece of 1×6 and the doors are simple tongue and groove construction with floating plywood panels. 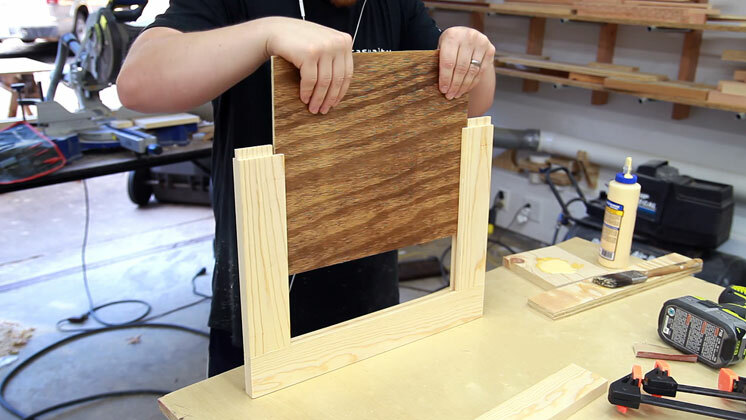 I’ve seen tongue and groove cabinet doors being made dozens of times so I’m familiar with the process but I’ve never actually made any before this project. I’m quite pleased with the way they turned out. 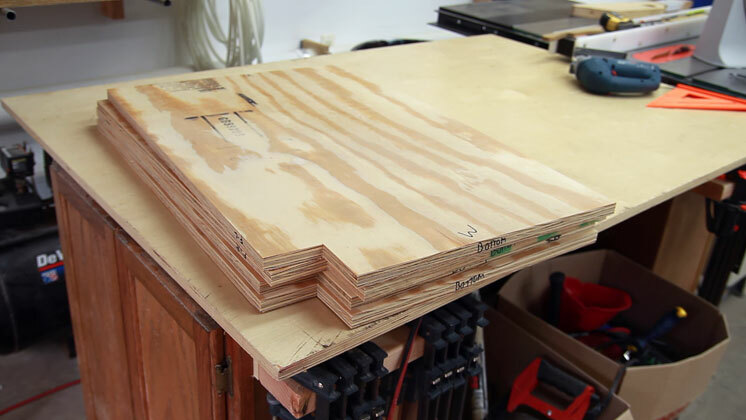 To start I cut my full sheets of plywood into more manageable sizes with a circular saw. 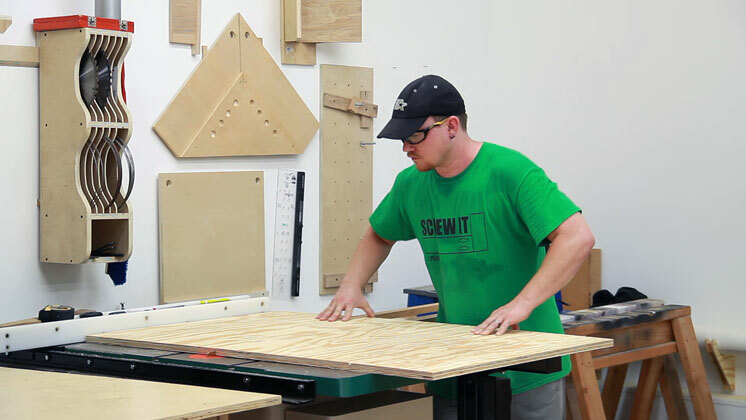 It’s much safer and easier to take half size sheets of plywood to the table saw than a full size sheet when possible. I used cheap 3/4” pine plywood for this. At the table saw things are much easier. The main pieces to cut here are the side panels, the bottom shelves, and then rip the remaining strips that will later be cut to length. Each side piece receives a 3” x 3” notch in the bottom front corner. This is for a toe kick. Two vanities so four sides total get this notch. A good blade in a jigsaw makes a huge difference in cut quality. These cuts felt the same as if they were made with my table saw. All of the face frame pieces were ripped from 1 x 6 pine boards. 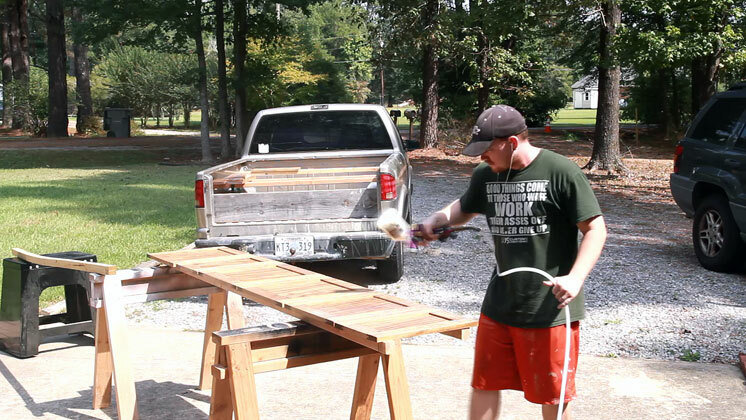 I often get asked what do I do to prevent my boards from warping because I use cheap pine. Well, the biggest thing I can say is to spend a lot of time picking out quality boards. If the place you get your lumber from doesn’t allow you to do that then they don’t want your money. That’s OK because their competitors will. I get mine from Lowes generally as it’s the only kiln dried supplier I have within an hour drive. 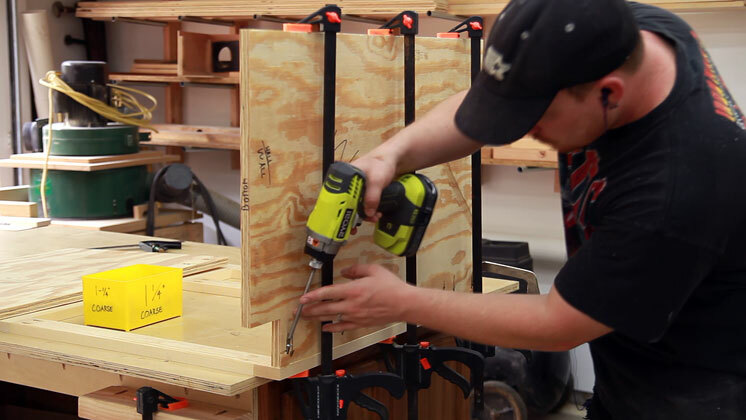 The general construction method for these cabinets is pocket holes. This past summer Kreg sent me a Foreman to play around with and boy does it cut down on production time. It’s a lot easier on my shoulder too. 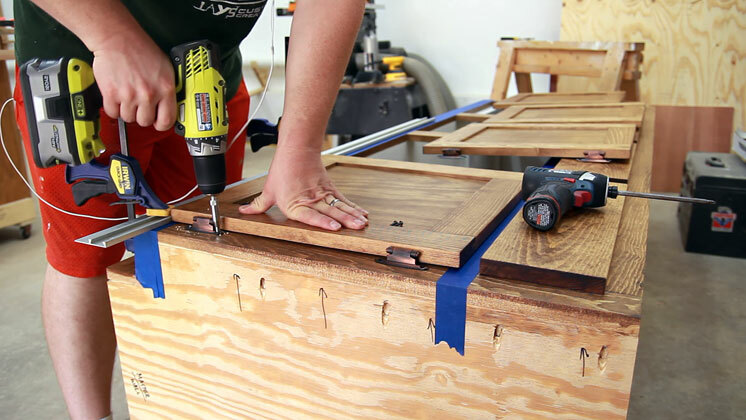 But the same task can be completed with a much less expensive pocket hole jig as well. With all of the pocket holes cut the face frame assembly goes very quick. After the face frames are complete I attached the side panels to the face frames with pocket holes as well. 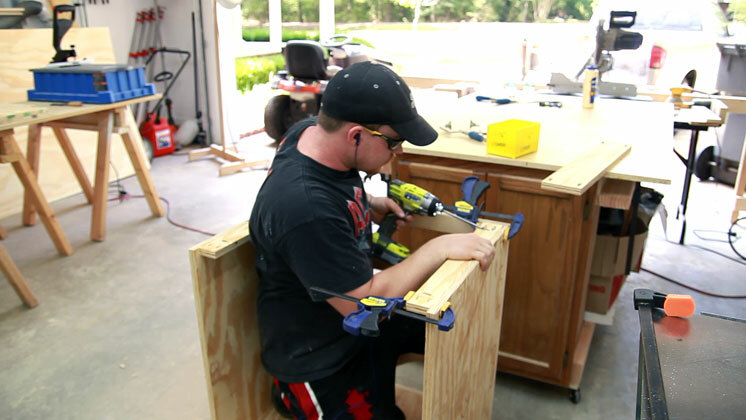 Each vanity had one side that was going to be against the wall so on those sides I put the pocket holes facing out. On the sides that were going to be exposed I put the pocket holes on the inside of the cabinet but I made sure not to put any where you could easily see them if the door was open. 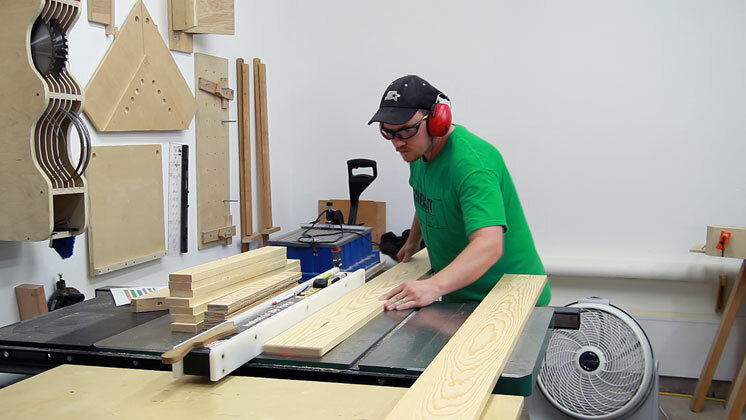 The bottom shelves were secured by floating tenons with my Festool Domino machine. Just kidding! Making sure you’re still with me here. More pocket holes. 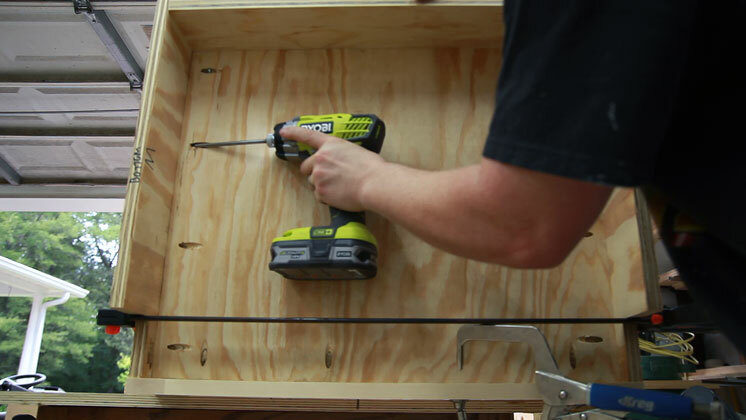 To give a little more support to the top perimeter of the cabinet as well as provide a surface to screw through to secure the countertop a couple strips of plywood are attached to the top side of the side panels. To add a little more access to everything stored in the bottom of the cabinet I added two slide out trays in the larger vanity. These are very easy to make and I’ve already made a very quick tutorial on them. I knew the doors would be coming up soon so I prestained the 1/4” plywood panel that will be cut for all of the doors. While the stain dried I knocked out the drawers real quick. 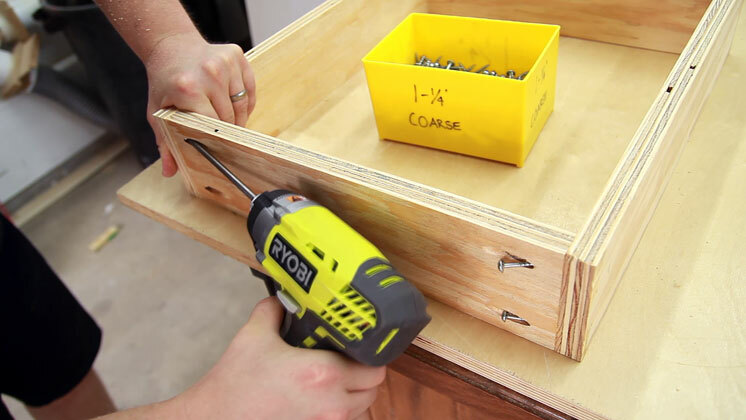 The drawer bodies were just 3/4” plywood pocket hole screwed together with 3/8” plywood glued and nailed directly to the bottom. Quick and easy. As I said earlier, the drawer fronts were nothing more than a 1 x 6 cut to length. I cut all of the drawer fronts out of a continuous board so the grain would flow from one drawer to the next. Time to make the doors. I’ll do a separate “how to” on tongue and groove doors in the future so I won’t get too complicated here. 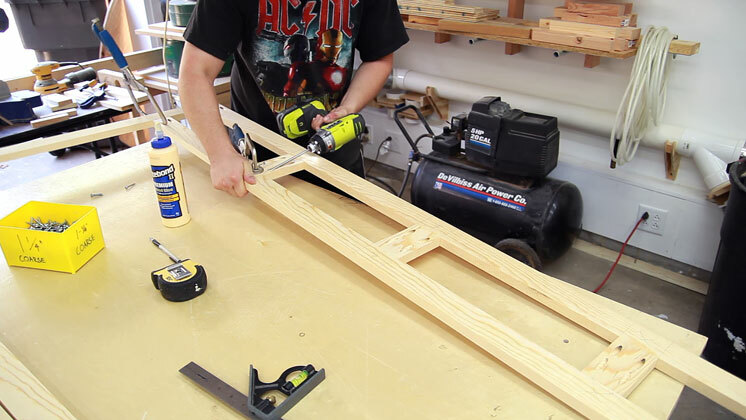 A grove is cut with a regular table saw blade on all of the door rails and styles to fit the plywood panels. I used my dado blade to cut the tongues on the ends of my rails. This was a lot easier to dial in than I had thought it would be. It’s given me a bit more confidence to maybe incorporate some mortise and tenon joinery in the future. 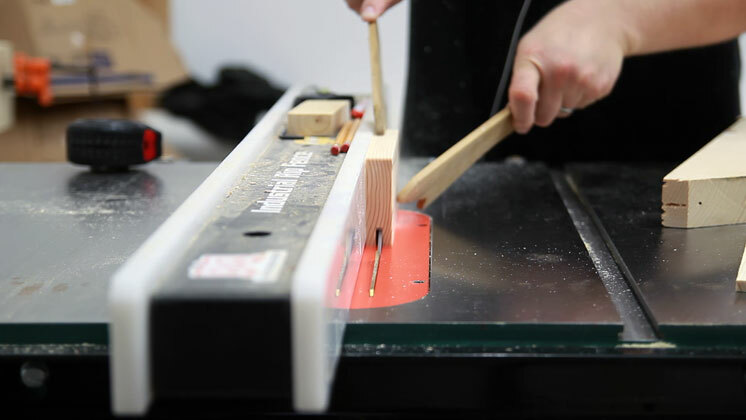 After two rails are glued to one style the plywood panel can slide into place. Then the other style can be glued on. Glue is only used on the tongues of the rails. To increase visibility I painted the interior of both cabinets white. It will help brighten up the dark areas when you’re trying to find something. After everything was sanded and stained I went with my old trusty finish: water based lacquer. I have been using Target Coatings EM6000 lacquer for a few years now but it’s getting a little expensive to buy online so I might try out a new finish or two in the near future. And the last step is to install the door hinges. I didn’t put any door or drawer pulls on these as she wanted to do that herself. Admittedly, this project took longer than I had anticipated. I got a little burnt out on it midway through so I had to take a break. In the end I actually had fun with the project and I learned a few new things along the way. 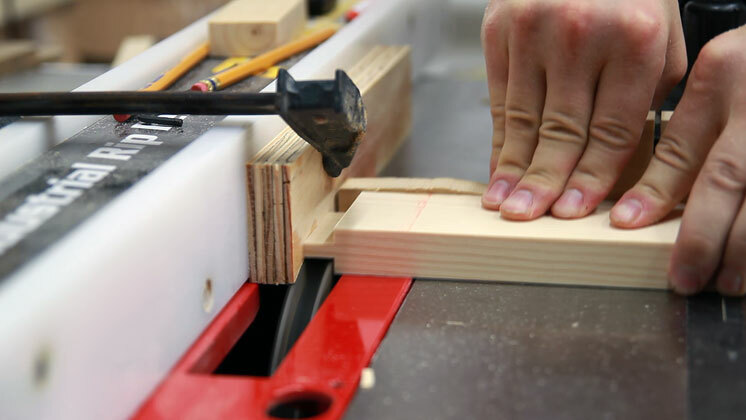 Woodworking is a continuous learning process. I hope you check out the downloadable PDF guide below. Although this guide is free to you remember that it isn’t free to produce. If you would like to show your thanks please consider using the donate button at the bottom of this page. If you liked this project and found it useful please share it so others can do so as well. Thanks for stopping by folks and have a great day! 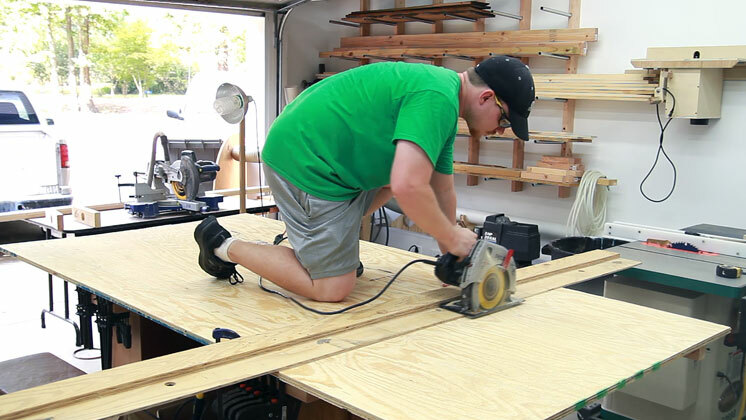 Jay, I loved the comment about the floating tenons and the Festool device. I’ve been watching for about a month now, and I really enjoy your videos and your common sense approach. Very cool Alvin. I appreciate it. Another great video, and I really like how you say, it might not be the best way to make them (not that i know) but its your way!! And that give people like me the confidence to try new things out and not worry about the “correct way” of doing things. Thanks again for a great video and as usual looking forward to more! I thoroughly enjoyed your video. Not only was it informative but humorous as well. This is the kind of villdeos that keep people coming back. Keep up the good work!!! Thank you Tammy. I’m glad you enjoyed it and I very much appreciate the feedback! Thanks! Jay, What color stain is that? The finish is beautiful. Hey Colby. That’s Early American Minwax stain. Old trusty. It looks great on just about anything! Hi Jay, thanks for all the cool stuff you do. Can I ask you how long it took you to build? With setting up the camera every time and recording it all I believe it took about 30 hours if I recall correctly. Jay what plywood grade did you use on this? CD pine plywood mainly because it was a budget build and I wanted to prove that you can still make nice stuff from cheap materials. I wouldn’t do it again though. It was a total pain in the but using it. 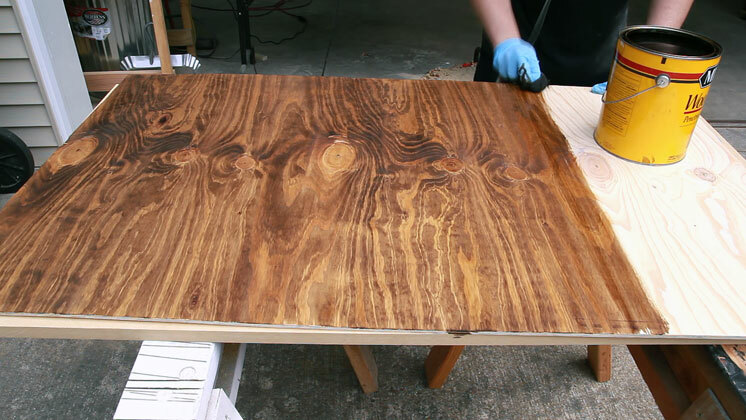 I would much rather spend a few extra dollars per sheet and get some BC birch hardwood ply. In the office you have “stiles” spelled as “styles”. Just thought you may want to know. Not sure how the word office appeared but I am sure I had.off… Auto correction is uh ahhh! Darn good job what is the main problem with using cheaper plywood it looks good. 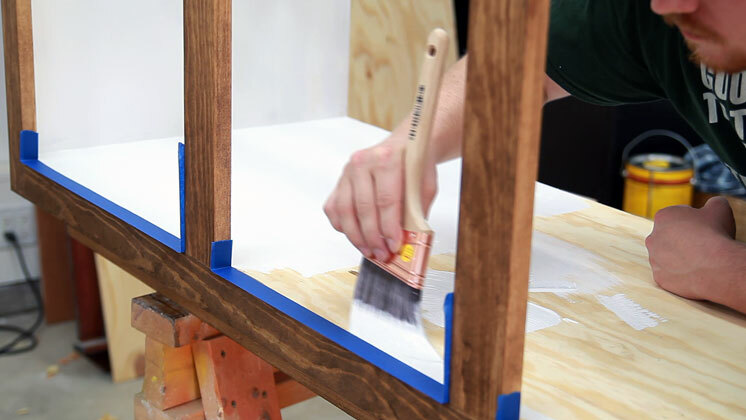 What would make higher grade wood easier to work with? thanks for everything you do. I was able to make a whole kitchen after watching a bunch of your videos. Ive just started my own youtube channel and the second video I made is about the kitchen. I hope Im not spamming here, feel free to check it out and I will be most happy for any advice you could have for me regarding both cabinet making and having a youtube channel. Siempre he querido hacer mis propios muebles. Ya que mi cocina requiere urgente alacenas y gabinetes. en el minuto 5:45 al 6:00 veo que utilizas la sierra para hacer ranuras y cortar las espigas para los marcos de las puertas. esto me pareció estupendo pues siempre se sale adelante si no se cuenta con fresadora (router)como en mi caso. felicidades y adelante con mas vídeos como este..
you make it look so easy I got to try this. Hi Jay, I just ran across your site and BOY!!! I’ve been looking for help like this for some time. I’ve just finished building my new woodworking shop and I need cabinets. Your plans look easy to follow and I look forward to receiving follow-up articles. Thanks for helping us beginners along the way!!! I just wanted to thank you for taking the time and bearing the expense to make all your videos and free plans, plus the PDFs, available to anyone and everyone who appreciates wood working in general. While I am only a retired pensioner and not exactly swimming in money, I have begun to arrange with Paypal to deduct a small amount to be sent to you in thanks for your time and effort for as long as I can afford to. Your enthusiasm and efforts have helped to make an old bloke more happy and content with his chosen hobby. I have now watched all your videos and tried a couple on my own with various levels of success (none is a level right?). My woodworking is just like my golf, its enthousiasm far outweights its results. I’ve lived in a appartment all my list and now at 40 I just bought a house. 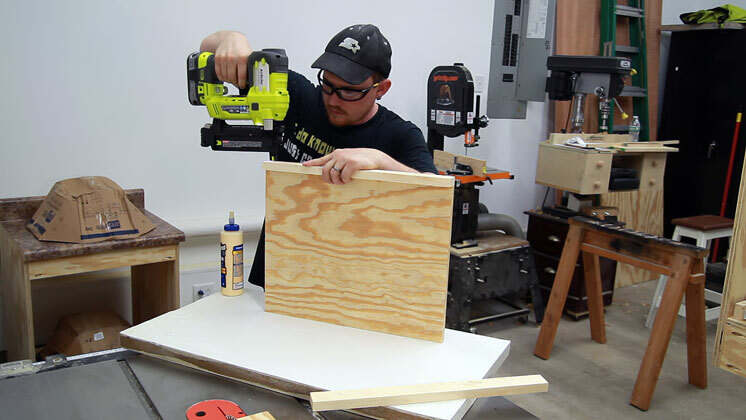 I have a very little shop space in the basement and I’m all hyped at making these cabinets for my workspace. 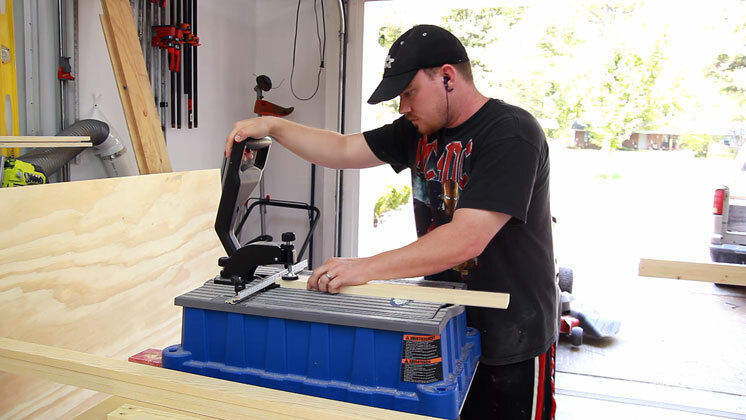 I’ll use the plans to make a mobile Miter saw stand and customise along the way. 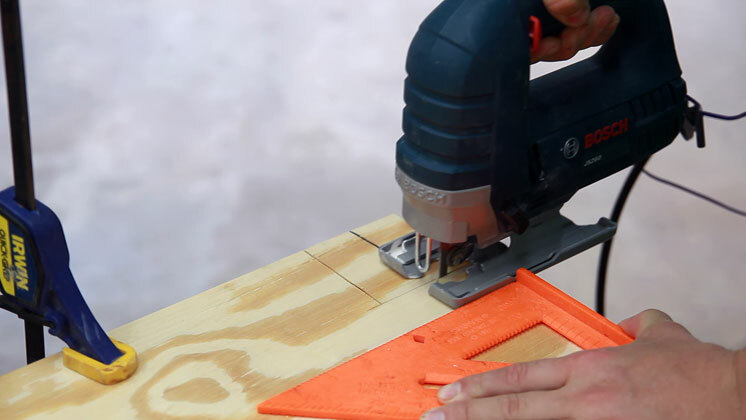 Jay, I watched your video and it was very helpful but when I printed it out there were no lumber cut list. Could you email me the lumber cut list for the 4 drawer cabinet. Hey Mark. Sorry but I don’t have a cut list for the 4 drawer cabinet. Love this video! I’m planning on making my own kitchen cabinets for our cabin. Where did you get your pocket hole table? Much faster than the jig! 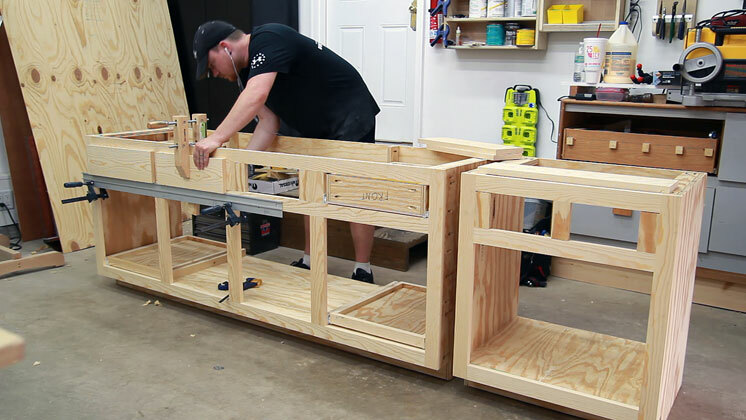 Enjoy your videos – learned a lot – will be building cabinets for a friends in his garage using your technic – Thx keep up the good work and videos.